Under the medium- to long-term strategy of developing human capital, the Human Resources Department cooperates with the Technology and R&D Division to provide employees with education on quality and PL as part of the quality and PL management activities. In the company-wide technical training, employees learn that they should give first priority to safety and making sure that the company’s products are in line with the international safety standards so that the products are accepted in the market and society. Moreover, we tell our employees, by combining safety considerations with our high technology and high manufacturing quality, we can provide society with “safety, comfort and a sense of security” as added value. As the competition over technology development is intensifying not only with existing competitors but also with new companies both in Japan and overseas, including emerging economies, we seek to expand our areas of value creation by solving new technological problems and developing new applications of our current technologies. As an education system to drive Technology Innovation, which is set forth as one of the Basic Policies of the Medium-Term Management Plan, we provide employees with technical training on front-loading design based on the high-precision use of CAE*, sophistication of the motion control technology utilizing motorization, digitization and systematization, and on other methodologies to discover new ideas more promptly and efficiently. With a view to nurture the sense of high quality among engineers in the medium- to long- term strategy, we have started an internal Quality Management Training Program in FY2007, which we run every year. The program especially targets those who are expected to play important roles in the next generation. The attendees range from young to mid-career design engineers. We have been holding Group-wide training seminars since FY2007 to raise the product liability awareness and to encourage every employee engaging in aspects of designing, manufacturing, marketing, and servicing to apply the concepts into their daily jobs in order to deliver safety, comfort, and a sense of security not only to our customers, but also to end users of our products. We have been providing training for employees, starting from juniors, with instruction on past instances of failure in related industries. In doing so, we seek to ensure a commitment as a manufacturing organization, employee, and engineer to providing safety, security, and comfort, with the correct mindset. In order to reduce the number of prototyping and testing in product development, it is critical to use 3D designs and CAE analysis to examine product shapes in a virtual space. Nabtesco has established a unique curriculum through which not only our experts, but also our designers can learn to perform the CAE analysis. The CAE training is now a mandatory part of new employees training and contributes to the development of professionals who can naturally draw 3D images. We have implemented specialist training courses, such as fluid analysis and system analysis, since FY2016 and also plan to hold training for managers (evaluators) in the future. These training programs have helped develop more personnel who can think in a multifaceted manner. To realize business growth strategies and enhance corporate value, Nabtesco is strengthening the (present and future) core value of our business and implementing intellectual property strategies to secure our competitive advantage. The most important effort with regard to the intellectual property strategies is to create core value based on the accurate anticipation of market trends and customer needs and to take strategic measures for intellectual property (to secure know-how and rights). In particular, to expedite the creation of core value, we have continuously offered an introductory idea generation course based on the TRIZ (theory of inventive problem solving) method since FY2010. This training provides participants with an opportunity to learn methods of generating ideas for developing and improving products. 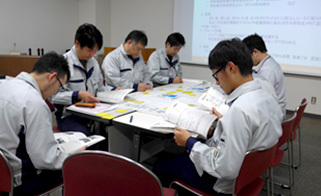 Trainees are instructed to identify the core value of the business and tasks they are in charge of and to actually generate ideas for realizing customer needs. Our aim is to develop leaders in idea generation who can come up with ideas for developing new products and improving existing products by drawing on their experience and the idea generation skills they learn through this course. In response to an increase in the importance of software applied in products, we have been consistently providing training on high design quality and the substantive demonstration of software reliability since FY2013. In line with the software development process, we have been consistently providing training on using the following three steps: requirement analysis, software design, and software verification. In FY2017, we introduced a new training course in line with the model-based development (MBD) methods and is continuously working to improve software design quality. 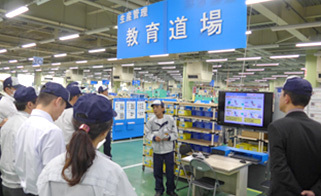 To improve our organization's strength in product quality at overseas facilities, we are providing training for workers who are dispatched overseas and to contact persons for overseas facilities. Specifically, we offer instruction on cultural aspects that are different from those in Japan, such as the ways of thinking about quality and how to proceed with administrative work in other countries. We encourage trainees to develop an understanding of specific ways of going about their work, such as how they should give instructions or check progress. Since FY2015, we have been conducting regular training programs on quality improvement methods, which aims to develop the ability to understand the product functions, predict and analyze quality issues in design work, and provide quality guidance and education. The training is mainly targeted at workers in charge of technical quality. We seek to cultivate engineers who are truly helpful from the viewpoint of customers and who can design products that satisfy customers based on the key principles. In line with the diversification and globalization of the economy and society, we receive a broader range of requests regarding our products. It is no longer enough to provide products that meet the needs of customers in terms of functions and performance. We must also ensure that the products can demonstrate the necessary functions and performance stably under various conditions of use. In response, in addition to the ordinary performance test, we also conduct tests to examine the behaviors of our products under various foreseeable environments by considering all the possible usages from our customer data. Thereby we continuously make further technical and quality improvements on our products to ensure customer safety. To manage the product quality, including managing the quality of products actually in use, it is necessary to implement a range of measures. Accordingly, Nabtesco is fostering education of personnel with expertise in such quality management thorugh quality improvement workshops. At these workshops, quality managers share their past experiences and examine quality improvement measures. With regard to product safety, our in-house companies have previously implemented all safety measures required by the standards of related industries, and we have established a satisfactory level of product safety. Out in the market, however, even firstclass manufacturers are facing a range of product safety issues, such as abnormal product breakages and problems due to defective components, which often lead to product recalls. Product safety has, therefore, been attracting an increasing amount of public attention and there is growing recognition that manufacturers should be responsible for product stewardship as one of their CSR activities. In response to this trend, the Nabtesco Group is committed to ensuring even greater safety and security for its products by building a systematic framework in line with international safety standards as well as promoting the awareness of employees on and practical use of this framework. In particular, since FY2015, we have been working to provide customers with easy-to-read and intelligible user instructions in line with the relevant international standards to have our customers use our products correctly and safely.